Ever since the e-scooter company Bird took flight in Santa Monica last fall, there’s been controversy. Many people find them convenient, fun and an environmentally friendly alternative cars. Others say they litter the sidewalks and are dangerous. 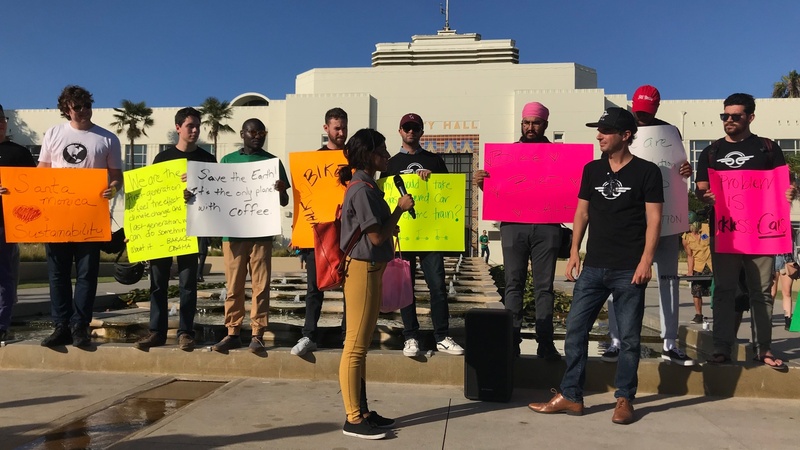 Santa Monica is now weighing a proposal that might result in taking Bird and Lime, the second company currently operating in Santa Monica, off the streets. 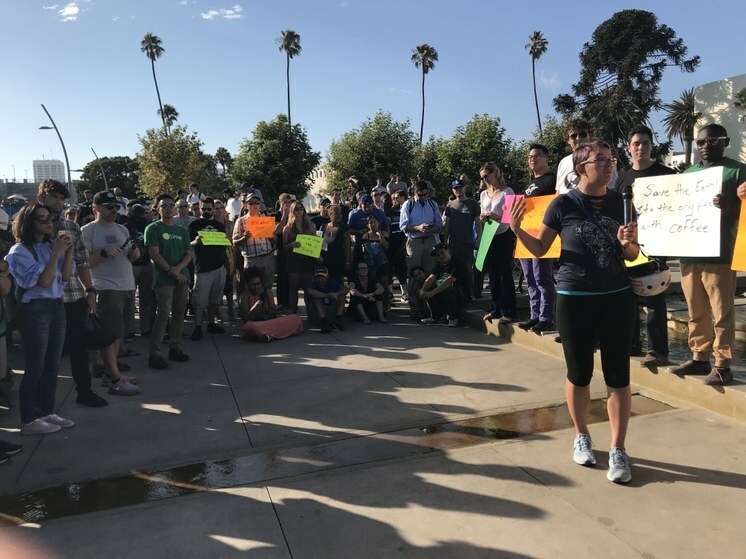 The companies fired back by deactivating their scooters on Tuesday and staging a rally outside Santa Monica City Hall. The Santa Monica City Council established a Shared Mobility Pilot Program on June 26, to figure out a way forward for regulating and integrating e-scooters into the mobility infrastructure in a way that would meet the demand for e-scooters while alleviating their problems. Thirteen companies applied for four shared mobility permits being issued by the city -- two for e-bikes and two for e-scooters. 1. Experience operating shared mobility device systems. 2. Proposed operations plan appropriate to the Santa Monica environment. 3. Ability to launch operations in a timely manner. 4. Public education and engagement strategies. 5. Compliance record with Federal, State or local law, or rules and regulations. 6. Financial viability and stability, and adequacy of insurance. 7. Proposed methods to address device parking, helmet use, and roadway safety compliance. So on Tuesday night, Bird and Lime teamed up to hold a rally in front of City Hall, prior to the regular City Council meeting. In response, the City released Wednesday morning the applicant proposals submitted to the city by all 13 companies. The protest crowd featured a mix of local Bird and Lime, employees, riders and "juicers" (people who now earn money charging Birds and Limes) getting up and making statements. Bird provided pizza at the end. Bird founder Travis VanderZanden was there. Protesters rally in support of Bird and Lime outside Santa Monica City Hall. Photo by Frances Anderton. There were lots of passionate speeches lauding Bird and Lime for making Santa Monica more attractive to locals and tourists, for providing work opportunities that restored people's self-esteem, for disrupting transit in a positive way, for saving the environment and, bottom line, for providing a sense of fun. One Century City resident said he comes to SM to ride the scooters, adding "we live in a day and age where people are buying self-help books and people are on antidepressants. . . and having Bird and Lime around gives you those opportunities again and again to hop on and just go and have a joyful happy experience. It's like you're a kid again." Even though a couple of the speakers reminded the audience that the City was not rejecting e-scooters outright, many people criticicized the high scoring given to Uber and Lyft, saying these companies were applying in bad faith because they represented the competition -- cars -- and wanted to drive e-scooters off the road. Some commentators called out the City for what they saw as an opaque selection process. They asked why they favored two companies with no prior experience operating e-scooters in Santa Monica over two seasoned local companies. Many also demanded to know why the City would choose two companies that were themselves routinely non-compliant bad actors in their first years of operation, and only added cars to the streets. Others inferred that Lyft had a built-in advantage with the City. Lyft recently entered into a partnership with Santa Monica’s Big Blue Bus. The Dial-A-Ride program provides rides for older adults and people with disabilities. Tim McCormick, manager of planning and performance at Big Blue Bus, was a member of the five-person in-house selection committee that scored the applications for the e-scooter permits. David Martin, Director of Planning and Community Development for the City of Santa Monica, is meant to make a final choice of e-scooter and e-bike companies by August 30. When asked why Martin might now support the behemoth ridesharing companies over Bird and Lime, Gupta told DnA Tuesday evening, "That history, the beginnings of that company. . . could be factors that our director of planning could take into account. But in addition, he has to look at the applications and look at scoring and I think it's just that combination of factors that will go into his final decision." 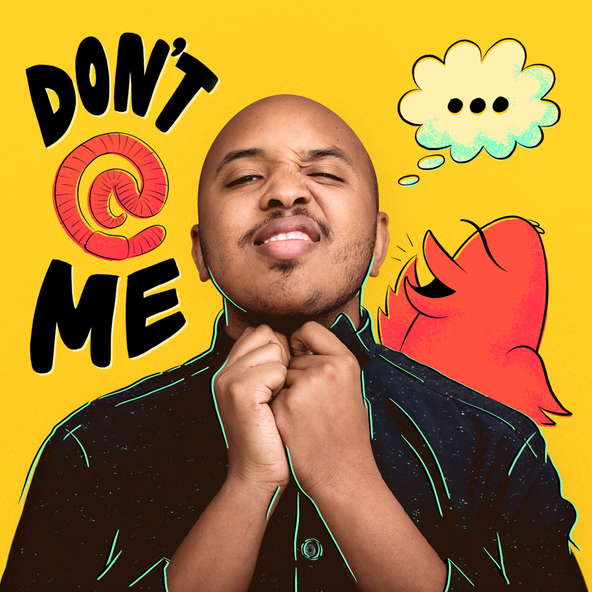 Meanwhile Bird and Lime are asking their fans to write to Santa Monica City Council; they say that thousands of emails have already been sent. 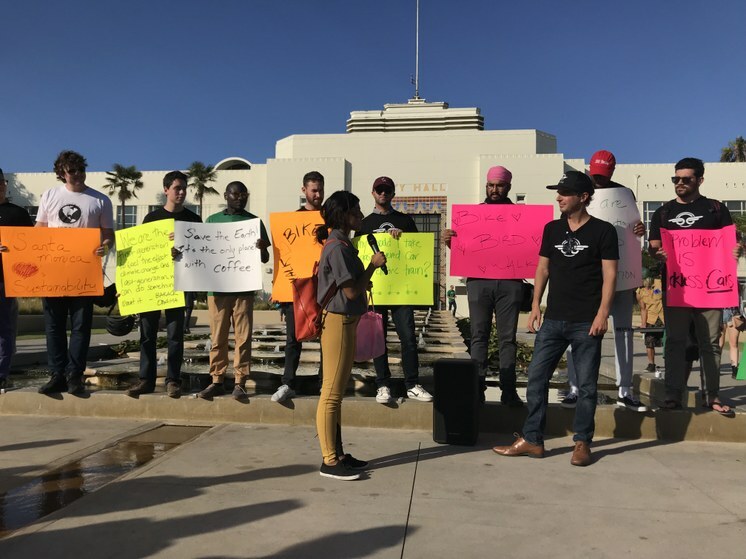 E-scooter companies Bird and Lime organized a rally outside Santa Monica City Hall on Tuesday evening. Photo by Frances Anderton.